Isn’t it great when good things come in twos? 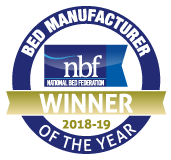 That’s definitely the case if you’re shopping for something special in a bed this spring as, here at Millbrook Beds, we’ve launched not one but two new bed bases to choose from. Back by popular demand, our new and improved ottoman divan base combines the sleek look you’ve come to know and love in our beds with the added benefit of maximum storage potential. The new ottoman base from Millbrook Beds lifts to allow you to declutter your bedroom by making use of full under-bed storage for all those bits and pieces you want out of sight and mind, especially as you declutter your mind ready for sleep. Also and, again by demand, we’ve released an elegant bed frame on legs. And to celebrate the novelty of being on legs, our new bed frame was beautifully modelled for us by the legs of Team England gymnast Mimi Cesar!